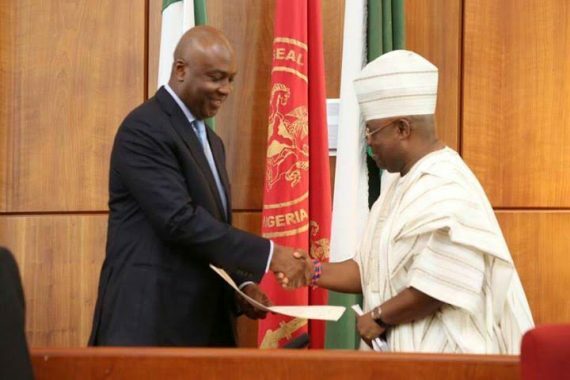 Senate swears in Adeleke as Osun-West senator – Royal Times of Nigeria. The Senate has sworn in Ademola Adeleke as the lawmaker representing Osun West Senatorial District. The new lawmaker was dressed in white agbada and ‘M’ shaped cap, the signature dress of his late elder brother and predecessor, Senator Isiaka Adeleke. The senior Adeleke represented the senatorial district at the Senate before his death on April 23, 2017. The younger Adeleke walked into the chamber at 11:19 am, accompanied by his wife, children and some unidentified guests. He was sworn in immediately. Clerk to the Senate, Mr. Nelson Ayewo, conducted the oath taking in the presence of President of the Senate, Bukola Saraki, and other lawmakers. The process ended at 11:22 am, after which Adeleke walked to Saraki for a handshake. The ceremony took a dramatic turn when the Deputy Minority Whip, Senator Abiodun Olujimi (PDP/Ekiti-South) led Adeleke round the chamber to introduce him to members of the PDP caucus. As this was ongoing, Adeleke made his now popular dance steps, which generated laughter in the chamber. A video of the lawmaker’s peculiar dance steps in celebration of his victory at the by-election had gone viral on the Internet and social media. Adeleke had defected from the All Progressives Congress to the PDP before the poll and defeated the APC candidate and choice of Governor Rauf Aregbesola, Senator Mudashiru Hussain, at the district’s by-election on Saturday. The Independent National Electoral Commission had issued a certificate of return to Adeleke on Tuesday. The late Adeleke represented the district on the platform of the APC, while his younger brother succeeded him as PDP senator.